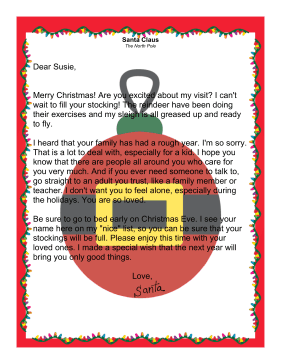 This letter from Santa alludes to a rough year, and assures that child that he or she is loved, and sends his wishes for a better year in the future. This letter is appropriate for sad situations such as a death in the family, a military deployment, or another challenging situation. Merry Christmas! Are you excited about my visit? I can't wait to fill your stocking! The reindeer have been doing their exercises and my sleigh is all greased up and ready to fly. I heard that your family has had a rough year. I'm so sorry. That is a lot to deal with, especially for a kid. I hope you know that there are people all around you who care for you very much. And if you ever need someone to talk to, go straight to an adult you trust, like a family member or teacher. I don't want you to feel alone, especially during the holidays. You are so loved. Be sure to go to bed early on Christmas Eve. I see your name here on my "nice" list, so you can be sure that your stockings will be full. Please enjoy this time with your loved ones. I made a special wish that the next year will bring you only good things.